I call it a “UFO” since it was a “flying object,” but I couldn’t positively “identify” it — it was moving too fast and got blurred in my photo. 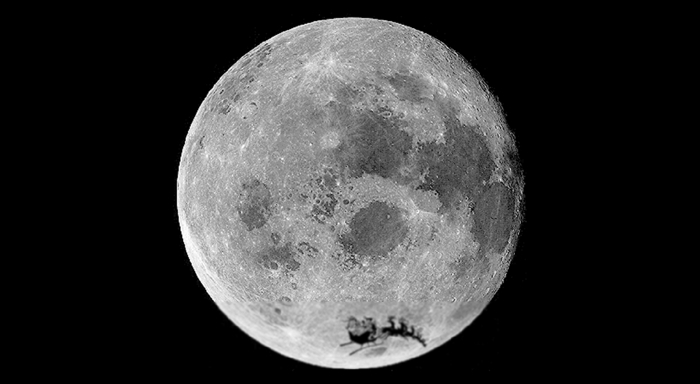 You can definitely see something that might be a sleigh moving past the lower edge of the Moon. It could also be a flock of birds, or maybe even some weird shaped cloud. What happened late that night back in the 70’s was pure luck. I just happened to have my telescope pointed in the right direction. Whatever I saw, it was silhouetted against the bright lunar disc. I’ve seen this happen with birds and airplanes occasionally. But unless you’re set up for photography, there’s never enough time to get a camera attached and take a picture. It usually happens way too fast to react. So have I ever seen Santa’s sleigh? Yes … I believe I have.